The Knicks were on the verge of losing the 7th straight game when they ended the third quarter 13 points behind the Bucks. Prior to this game, New York managed to win only one (on December 20th, against the Pacers) after trailing before the fourth quarter so the odds were not in Jeff Hornacek’s team favor. 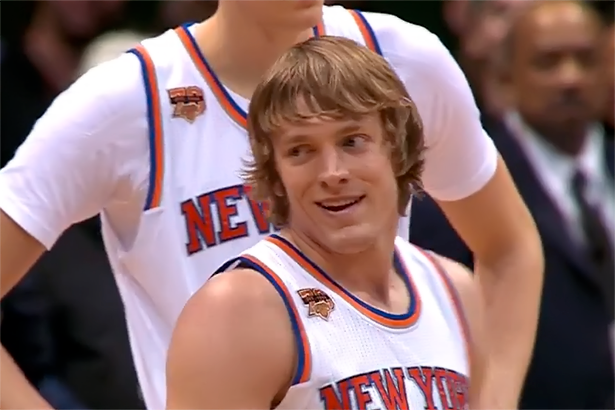 But coach Hornacek decided to sit Derrick Rose and play with Ron Baker the entire act. Baker ignited the Knicks on a 12-0 run in the start of the quarter to get them back in the game. The Bucks replied with a couple of consecutive threes made by Tony Snell. However, Kristaps Porzingis would not let this one slip away after missing the previous three games and nailed a three pointer. At the next play he delivered 2 blocks to the hero of the previous confrontation, Giannis Antetokounmpo, then made another jumper from behind the arc to keep the Knicks close, 103-104. New York would lose Joakim Noah after getting fouled out, then Porzingis too. The key moment happened in the last minute, when Lance Thomas forced a turnover at Antetokounmpo, and Courtney Lee made a layup on fast-break off Baker’s assist to put the Knicks up, 114-111. With 22 seconds on the clock, Mirza Teletovic missed a three pointer and the chance to tie the game and as Ron Baker rebounded, he was quickly fouled and sent to the line. The rookie made both free throws and closed the game with the final score 116-111. Carmelo Anthony scored a game high 26 points (including a decisive three pointer in the closing moments of the game) and delivered a game-high 10 assists. Baker had 6 points, 4 assists and 2 rebounds in 12 minutes and his effort was praised by Anthony. Lance Thomas finished with 10 points off the bench and played a major role when he defended Antetokounmpo in the final minute. He stood close, reached in and dived after the ball on a similar play that haunted the Knicks two nights ago, when the Greek Freak delivered a jumper over Thomas at the buzzer to steal the win. This time, it was the Knicks who stole it. Porzingis had 24 points, shooting 9-14 and six rebounds. Rose scored 12 and delivered 8 assists while Courtney Lee ended with 11 buckets.